After arriving in Vancouver last week I needed a familiar pick me up. I ventured out to take a walk on Vancouver's famous Robson Street and to generally get the lay of the land. A couple of blocks later and a big sign beckoned to this Canadian. Was it mirage? Was it a miracle? 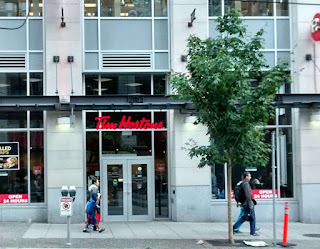 I walked up the block and in the front door to the famous Canadian institution located 463 Robson Street, Vancouver, Tim Hortons! This Tim Hortons takes full advantage of it's downtown slightly tight urban setting. As soon as you walk in the front door a sign directs you to the spot to line up. The que area can hold maximum three customers only waiting for one of the three cashes to become available. Normally this set up works but if one of the cashes is closed or there is a hold up due to customer errors or filling a large order, customers may end up quing out the door. The Order: 1 Medium Black Original Blend Coffee. How come in Vancouver the Tim Hortons Medium Black Coffee is $1.80 as opposed to in Ottawa being $1.70? To further add intrigue, how come in Vancouver and Ottawa a Tim Hortons Small Black Coffee is both $1.50? Why the additional $0.10 difference for the medium as opposed to the small? 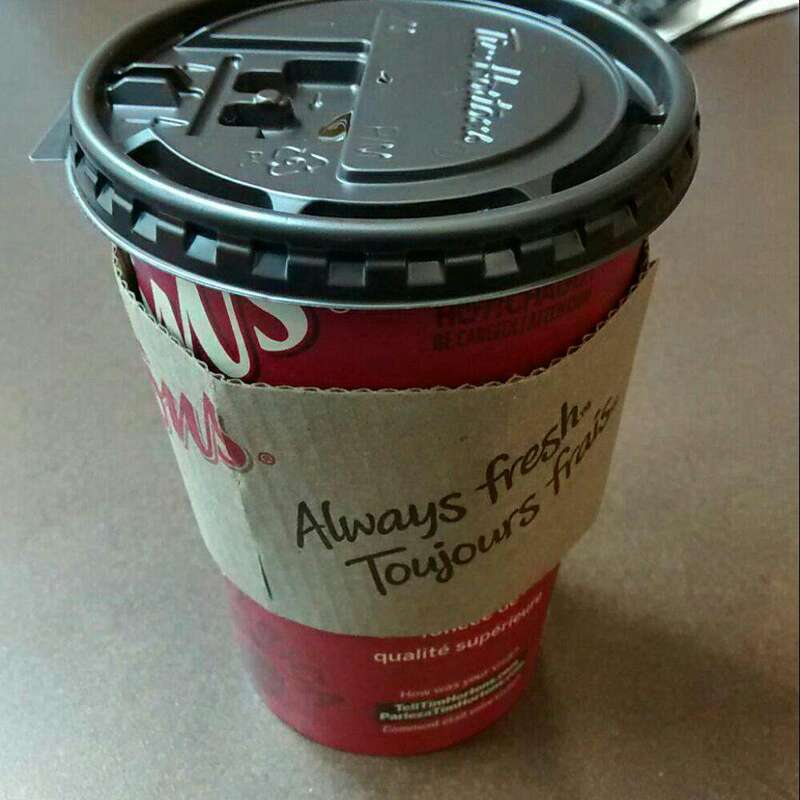 Anyway, I enjoyed the medium black coffee as any Canadian would. 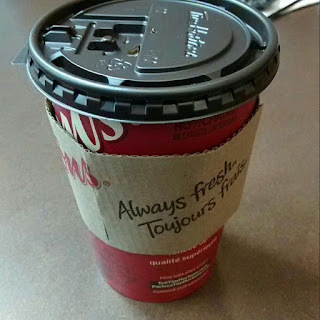 The coffee was made to specifications in terms of warmth and strength in a standard issue Tim Hortons cup. It would make the President of Tim Hortons himself smile! The seating areas though needed some attention. 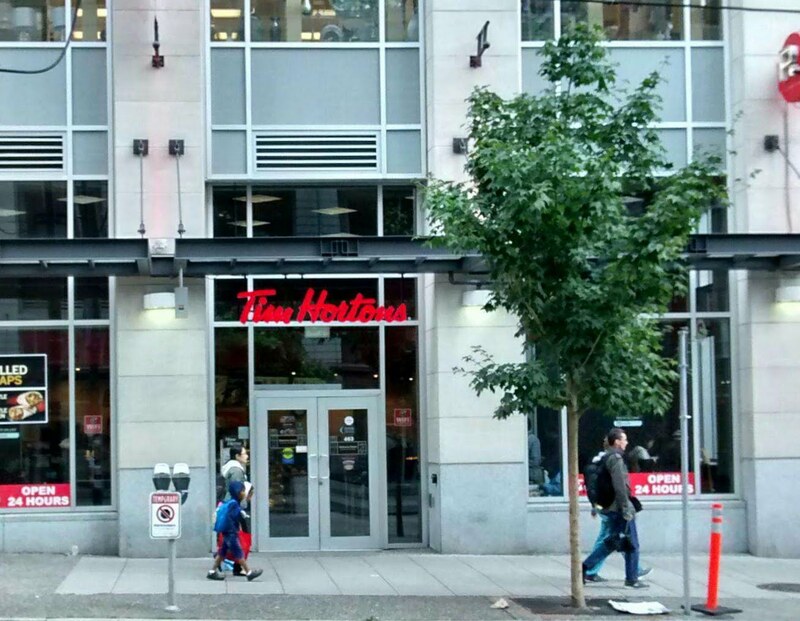 Despite this being a downtown urban location, this Tim Hortons had more than adequate seating to handle the volume of customers. However, unlike many other Timmies worship locales, this location's seating area was dirty with crumbs and coffee stained tables. It appeared nobody had been hired to ensure tables were wiped or the floors swept and mopped on a regular basis. I've since returned this location a couple of times and was forced to strategically select a cleaner table wherever possible. Service wise the location is impeccable. Short waits in line and a sandwich bar preparer who always seems to keeps things moving. Overall, this Tim Hortons location has excellent counter service while serving average "nothing special" corporate Tim Hortons fare. A few tweaks around the edges to affect cleanliness of the seating area would help make this location an all start showpiece of Tim Hortons' family in the Vancouver area.